Starting with a 1988 reissue of AMT's 1963 Willard Battery Special, as driven by Parnelli Jones, from the MPC/ERTL three-car Indianapolis Hall of Fame set, Howard scratchbuilt the oil tank that hangs off the left side of the car. He next filled in an unecessary scoop in the nosecone, maded changes to the interior and windscreen, and deleted the rear nerf-bar bumper. He also added resin one-piece tire/wheel units from Etzel Speed Classics that required careful masking and circular templates to paint. 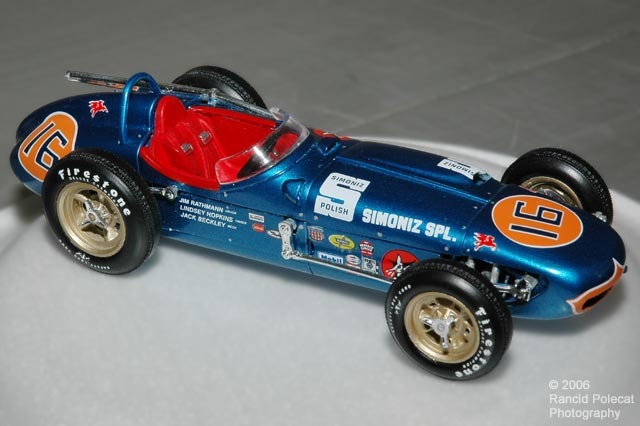 Howard coated the body in Plastikote GM Metallic Blue from a rattle can and applied the appropriate Fred Cady decals. Unfortunately, Cady is no longer in business, but Indycals.com offers a variety of Watson Roadster decals from this era. Gone too, is Etzel Speed Classics, but similar wheel/tire sets are available from Lance Sellers Resin and Bill Jorgensen Resin.